Acknowledged as a master of the Galician gaita (a bagpipe whose bag is traditionally made of the skin of a goat), Cristina Pato is no stranger to both breaking and crossing musical borders. In 1999, Pato was the first female gaita player to release a solo album in Spain. Pato has also studied music in the United States, and she is skilled on the piano as well; to date, she has released two piano albums, and six albums on the gaita. Pato has combined her interest in the Galician bagpipe and classical music, launching projects that create newly composed music for such a fusion; and, she has also been a featured member of Yo-Yo Ma's Silk Road Ensemble. Her own band bravely wheels between her own music and Galician heritage, other world music, and jazz and classical influences. Rústica, though, is a project that one could best describe as a homecoming. The emphasis is on traditional Galician tunes and songs, which have inspired a new repertoire with Pato's accompanying musicians. The project predominantly features the vocal and percussion work of Davide Salvado, whose voice is resonant, soulful and mournful. Anxos Pintos plays hurdy-gurdy, and Roberto Comesaña (who has collaborated with Cristina Pato for five years), accompanies on accordion. The project highlights the inner workings of this small ensemble, and the result is decidedly not the over-produced product of a world music superstar. 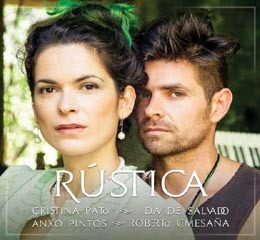 Cristina Pato's incredible gaita playing does not overwhelm the musicians, and the performances on Rústica are so pure that Pato does not emerge as a leader as much as an integral part of a quartet speaking with one mind. On an upbeat selection such as “Erbecedo,” Salvado's vocalizations are carried along over Comesaña's accordion while Pato soars into the upper register of the gaita. “Mens” may sound like a pastoral, medieval festival, but I am more fascinated by the restraint on other tracks and the melancholy that they arouse. Sometimes, it is not so much what is said than what is implied in these tunes that leads to such sublime results. “Meu Cabalo” opens the recording with the drone of the hurdy-gurdy, before Salvado's beautiful voice enters. The effect is stark, and the world falls away; Pato responds with her gaita, Salvado joins with his tambourine, and then Comesaña's accordion joins the singer. The listener is treated to real intimacy, that signals the camaraderie of the entire project. Another highlight comes in “Grao a grao,” where late in the track Pato's gaita is relegated to the background while Comesaña circles the tune on his accordion, Salvado's voice and percussion touching the surface of the music as the space gets wider and more mystical. “Ruada macabra” is drenched in quiet, but it is pierced through by interesting dissonances that are evidence of thoughtful experimentation.